312 x 228 mm. – 270 leaves. 87 historiated initials on burnished gold grounds, all within pink or blue and burnished gold frames terminating in three-quarter borders, 1 large opening miniature with full border and coat of arms. The "Golden Legend" in the French translation of Jean de Vignay, illuminated by the Master of the Bible of Jean de Sy/workshop of the Boqueteaux Master. In an 18th-century binding bearing the coat-of-arms of Louis de Gand, de Merode, de Montmorency, prince d’Isenghien et de Masmines (d. 1767). The Golden Legend, or Legenda Aurea, is one of the classic works of the Middle Ages, containing lively tales of saints' miracles written in a simple style to address a wide audience. Hardly any text has been more popular and its texttradition, therefore, offers quite interesting variants all over Europe. 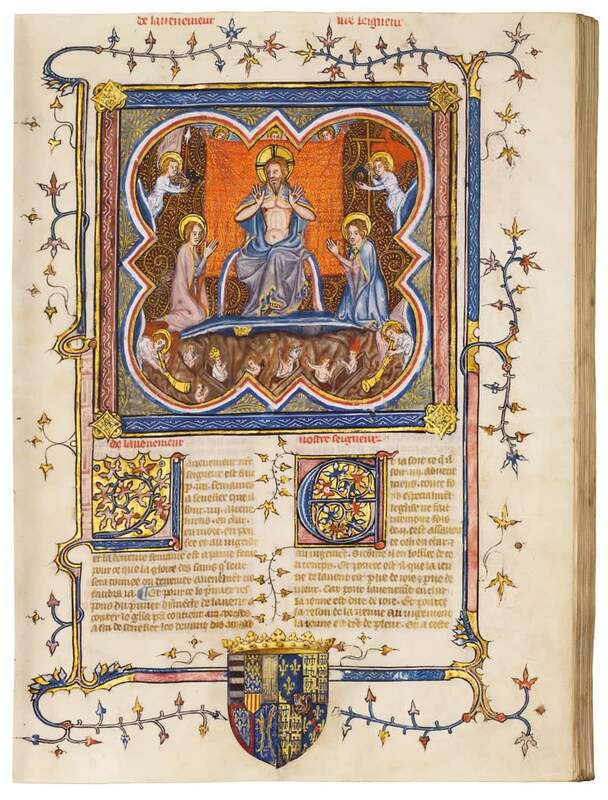 The manuscript comprises short legendary texts on the lives of saints and opens with an imposing miniature of the Last Judgement with Christ seated in heaven, flanked by the Virgin and St. John, mediators for the souls of the dead that arise from their graves. Almost ninety charming miniatures, well-chosen and self-explanatory, illustrate the individual texts. The illuminator worked in the Parisian Boqueteaux workshop. He has also been called the Master of the Jean de Sy Bible, after what is considered to have been one of his most important works (Paris, BnF, ms. fr. 15397). Some ten codices of the Legende Dorée may survive that were illuminated in this, most prolific shop in Paris active during the reign of Charles V (1364-1380). Our manuscript is the only one still in private hands. It can be compared in size and layout to that owned by Charles d’Anjou, René’s brother (London, BL, ms. Add. 16907).